CLEAR SOUND: the bells are made from high quality metal material which makes the sound very crisp. 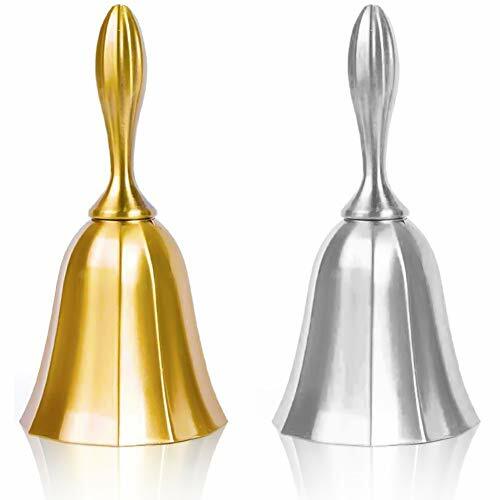 DAINTY AND EXQUISITE: gold and silver hand bells are small and delicate, and is a good decoration for your room or party. Just wipe the surface gently with a damp cloth. 1 golden bell, 1 silver bell, 1 paper bookmark. DomeStar is a brand focusing on producing high quality gift and toy, owned by Rainbow Town. Depending on good quality, environment-friendly and healthy, the products are welcomed by wide occasions. They are commonly used in home decoration, preschool education, festive gift and any place you can imagine. DomeStar is constantly committed to producing quality products for making customers have simple happiness feeling. Hope you have same feeling with me. 2 pcs desk call bell, 4" x 2" x 2", soft sound. The bell's ringing is clear, very helpful for the old to ask for help. Its sleek surface is very easy to clean with just a damp cloth. Widely used: Can be used in restaurant, B&B, hotel, stores,service bell, teacher bell, call bell for the elderly to ask for help, lunch bell to call kids, great tool for kids to play games and so on. What you extra get: a mini box opener, 100% money back guarantee, lifetime worry-free warranty and friendly customer service. If you have any questions about this product by DomeStar, contact us by completing and submitting the form below. If you are looking for a specif part number, please include it with your message.